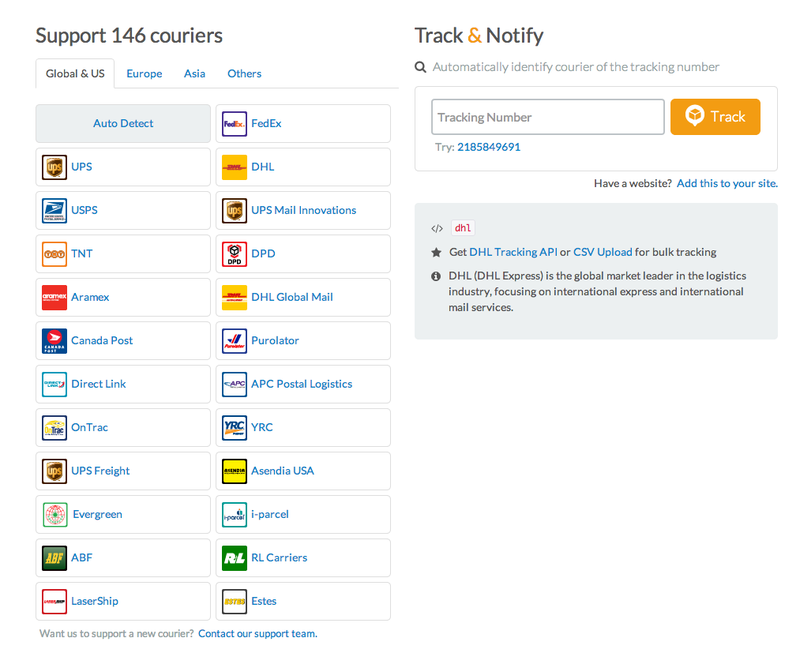 Track all shipments for 360 carriers - see Full List. 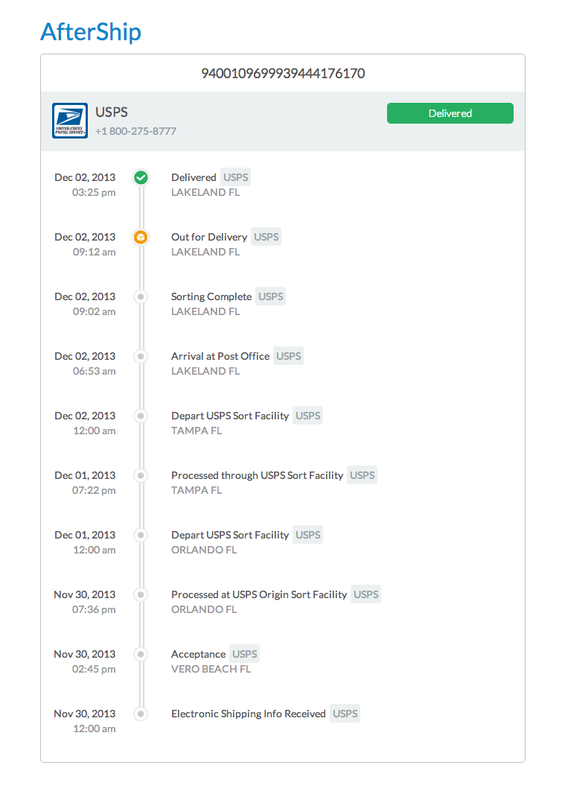 We have released TRACKING ADDON, that allow shop owner to track all shipments automatically in one place, and notify customers of delivery updates. 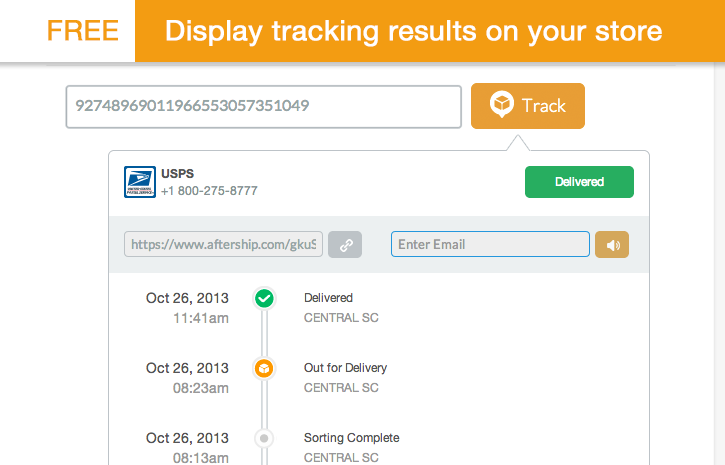 Your customers can also track directly at your website without leaving! 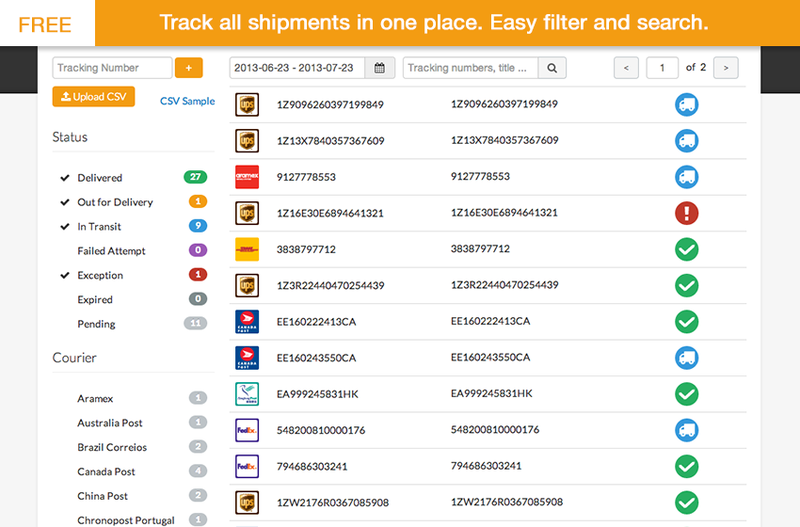 The module supports 324 carriers - including UPS, FedEx, La Poste, DHL, USPS.﻿ The module is really useful for merchants who receive customer inquiries about order status all the time. We are new here - love to hear your feedback! Thanks for the support! Email me your AfterShip login at andrew@aftership.com - love to give you $10 credit try out the notification service. I send about 100 consignments a day, not all via the website, some via sage line 50. This allows developers keys also. Would this be able to integrate with both my website and Sage. Currently we only integrate with CS-cart (and a few shopping carts) but not with Sage. We have a CSV import function - if that's helpful? Otherwise, we can explore integration with Sage. Will this work or the 3.0.4? If 3.0.4 support web services (i.e. you are able to get the API key of your CS-Cart), then this addon will work. Do buzz me at andrew@aftership.com if you need any help on integrating, and also love to give you $10 free credit. Thanks for trying out our service. 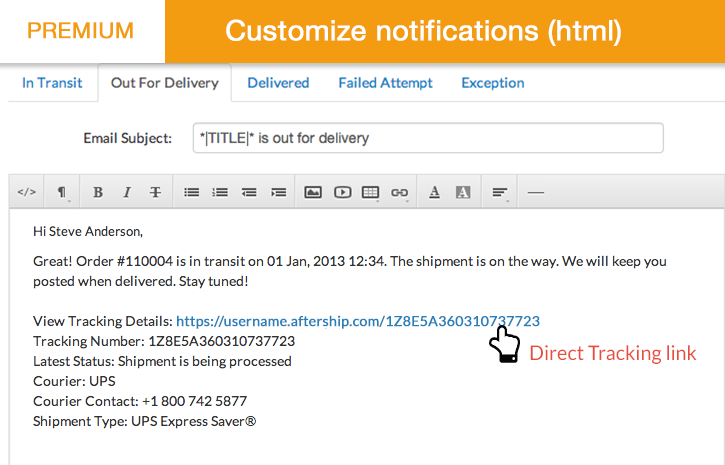 Do drop me an email at andrew@aftership.com, and i can pass you a free $10 credit to try out the notifications service. Hi Andrew, great to see that aftership is supporting cs-cart! ^^ I'm Ling that suggest the cs-cart integration at Aftership's uservoice section. Glad to see that it is up. Now, it's left for me to upgrade my store to v4 which supports the API integration. Currently, at v2.2.4, which does not support. hello and congratulations for your system. but you can add other couriers? in Italy there are a few! Hey Ling! Sorry that we don't support v2.2.4 due to the API integration. Wish we could support but that's the limitation of cs-cart API. Let me know when you are ready to use Aftership, love to give you free $10 credit to try out the service. Hi - love to add more carriers. Please send me the name and 2-3 tracking numbers at andrew@aftership.com, and we can take a look. Any chance you can provide a guide on how to add the track-button to the order details-page? We currently support ELTA for Greece. For Bulgary, Albania, Cyprus Post - please message me at andrew@aftership.com with some tracking numbers, and will take a look. And love to give you $10 credit to try out the notification service. Really hope to write the guide soon. 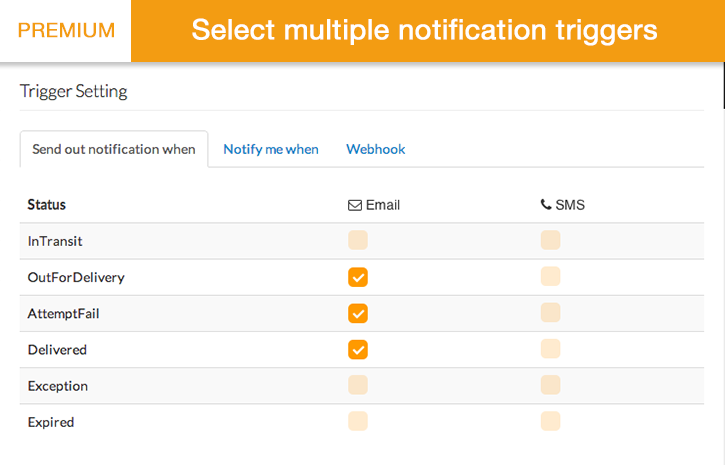 You can now insert a Free tracking widget to your PrestaShop - allow customers to track at your store without leaving! Learn how to insert Track Button to CS-Cart in 5 mins. AfterShip support 6 new couriers last week in Europe, Australia and India.